I picked up my love for the holidays from my mom. From the day after Thanksgiving until New Year's, the house was always blaring with Christmas music amidst my mom’s collection of 100+ Santa Clauses proudly on display. The house felt warm and loving. But more than decorations or music, every December my mom would trek my brother, sister, and me out of the house to complete a service project. From soup kitchens to toy drives, my mom made sure we participated in something greater than us. Of course when I was little, I didn’t fully understand the meaning behind “giving back.” It wasn’t until I was older that I would begin to look forward to our family service project. Now as an adult, these memories continue to be some of my most cherished. In 2013, I began working for MedExpress in the Communications Department. I started in late October, so it wasn’t long before the holiday season rolled around. This was the first time I got to experience the “Giving Back Program” at MedExpress – a company-wide initiative that aptly fit its name. MedExpress centers across the country, nearly 250 centers in 18 states, each select a local organization to support every year. 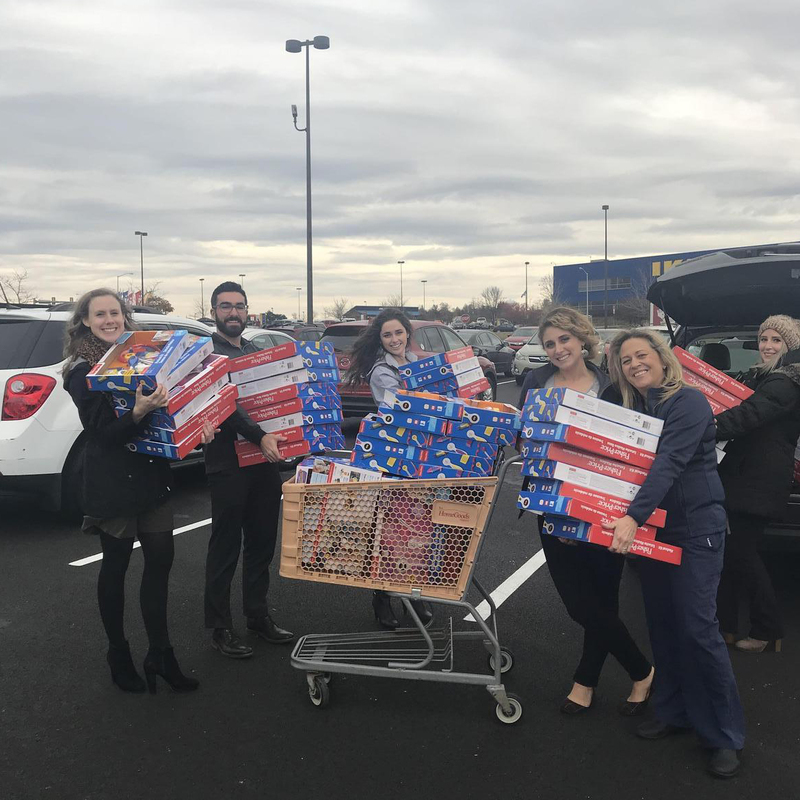 From volunteering at local nursing homes in Fayetteville, West Virginia to “adopting a family” for the holidays in Springdale, Arkansas to collecting donations for a women’s shelter in Washington, Pennsylvania, I was truly amazed at the outpouring of support from our centers on behalf of their communities. I was also struck by the sincere enthusiasm for the program. Team members across the country look forward to the Giving Back Program. They don’t see it as an obligation, but as a privilege – a privilege to extend the care they provide to their neighbors outside of their center walls. MedExpress team members see the Giving Back Program as an opportunity to put the company’s Genuine.Caring.Friendly® Values into action and to make a lasting impact in their local communities. When I saw this for the first time, I knew I had found a special place to work. A place at which I was proud to work. A place I was proud to tell my mom about. Since then, the holidays continue to be my favorite time of year to work at MedExpress. Year after year, our center teams continue to blow me away in their creativity, generosity, and spirit. Last year, our teams completed hundreds of volunteer hours and donated boxes upon boxes of canned goods, clothing, presents, and supplies to local charities, including animal shelters, the Salvation Army, local religious institutions, food banks, Toys for Tots, the United Way, senior communities, and more. And 2017 is shaping up to be another incredible year of giving back. Here’s a look at just some of the amazing work being done by my colleagues across the country. 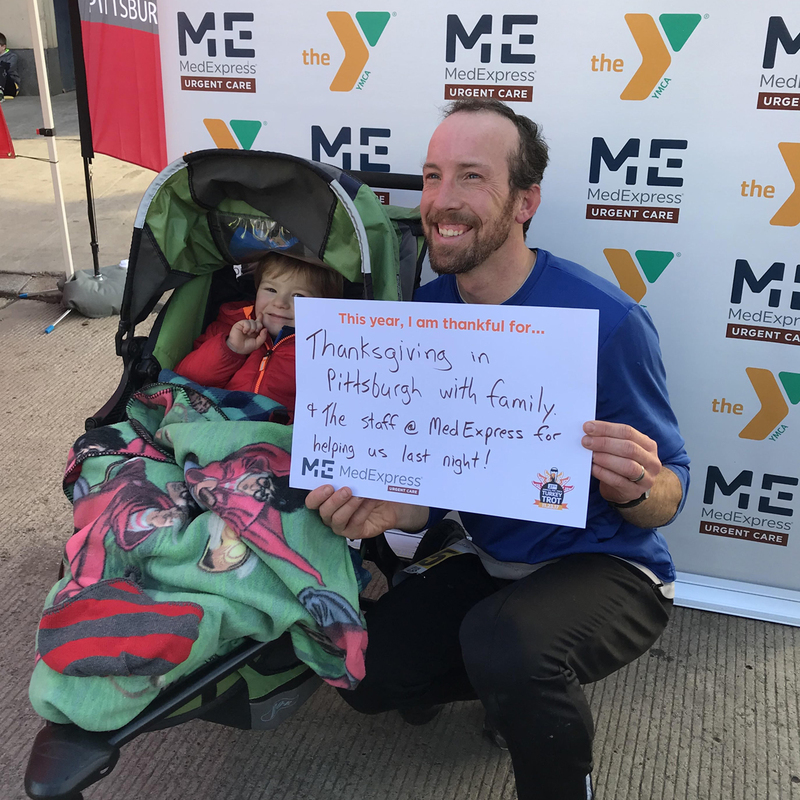 MedExpress is supporting Turkey Trots in several communities, notably in Pittsburgh, Pennsylvania and New Tampa, Florida, where we help sponsor the events but also have many team members who participate. Turkey Trots are amazing, because by the nature of the event, they support a healthy activity on a day filled with overindulgence and too much turkey, and they also serve as donation points for local nonprofit organizations. This year’s Pittsburgh Turkey Trot supported the YMCA and collected 5,000 pounds of food to help feed neighbors in need. The New Tampa Turkey Trot donated a percentage of the event’s proceeds to local organizations such as Feeding America Tampa Bay, Florida Hospital Wesley Chapel Foundation, and others. 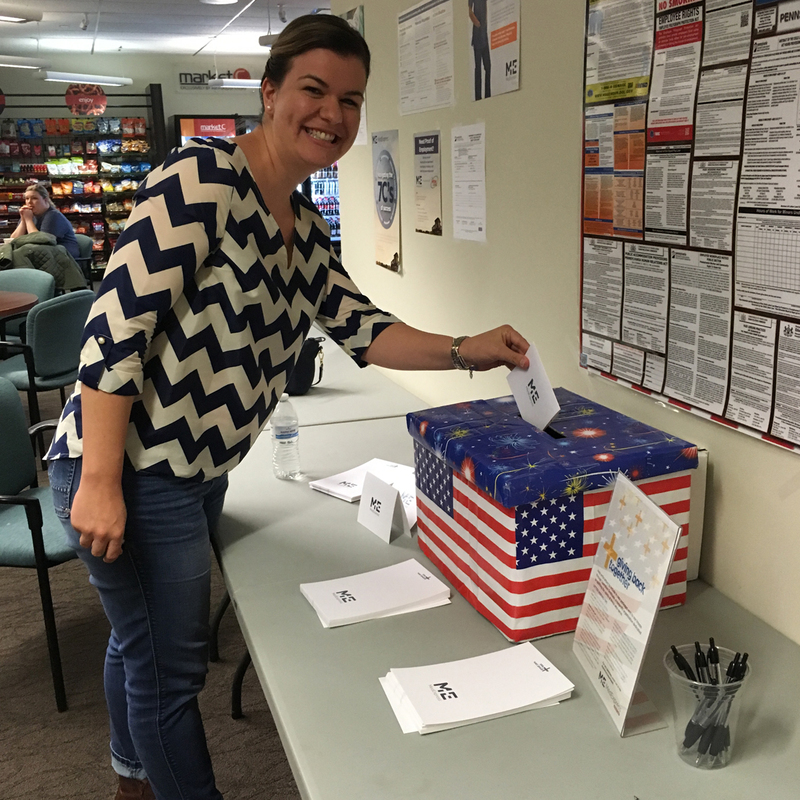 Team members from across our organization wrote more than 50 letters to troops overseas through an organization called Operation Gratitude. The letters gave MedExpress employees the chance to personally thank our service members and wish them a happy holiday season. ‘Tis the season for Stuff-a-Bus, a toy drive sponsored by 96.1 KISS, a local radio station in Pittsburgh. This year, MedExpress team members donated 100 toy medical kits. Each year, a group of people from MedExpress head down to the event together to make the donation in person. MedExpress has two administrative offices located in Canonsburg, Pennsylvania and Morgantown, West Virginia. These offices are filled with finance, marketing, human resource, and IT professionals who help support our centers so that our medical teams can take care of patients. This year, the administrative teams are rolling up their sweaters to build winter warmth kits for local homeless shelters, raffle off baskets for the United Way, and collect gifts as part of Wesley Family Services Holiday Helpers Program, which provides gifts to local children and families who may otherwise go without. A group of fashion-forward MedExpress center managers in West Virginia are donating their time this season to give makeovers for seniors at local senior centers. The list goes on. This is what it means to be a part of the MedExpress family, and I couldn’t be more honored to work alongside people who care so deeply for others. And as I look to continue my mom’s tradition of holiday giving with my own children, I need look no further for inspiration than the people I work with every day. Annie Jamieson has been a member of the MedExpress Communications Department since 2013. She’s a Pittsburgher, a mother of two young boys, a holiday fanatic, and a below-average Christmas caroler.